Erik Affholter attended Oak Park High School in Ventura County where he was a first team ‘USA Today’ All-American in 1983. A ‘LA Times’ running back of the year, Erik set a national high school kicking record with a 64-yard field goal and when he started as a USC Trojan he was more known for his kicking than receiving. 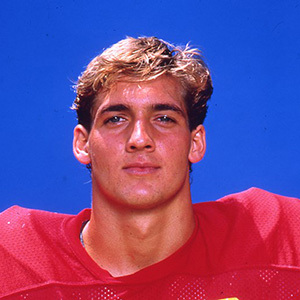 At USC he became a Pac-10 All-Academic selection and an All-American wide receiver where he graduated as the all-time leader in career receptions with 123. Upon graduation he became a distinguished member of the USC Skull and Dagger society. Affholter, in 1989, was drafted in the NFL 4th round by the Washington Redskins and then traded to the Green Bay Packers. He played professionally for the Packers and San Diego Chargers before retiring in 1995 from a career ending knee injury. Since retiring, he has been coaching high school and youth football for over 20 years, earning 3 California state titles and helping over 200 players earn scholarships. Erik will live for a lifetime in USC football history by scoring the controversial memorable winning touchdown on a juggling end zone reception in the 1987 upset of UCLA. The catch landed him on the cover of Sports Illustrated.